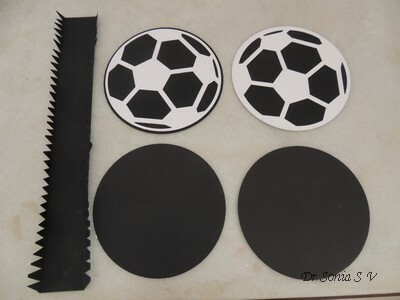 You can see the Soccer ball diecuts in the picture above . 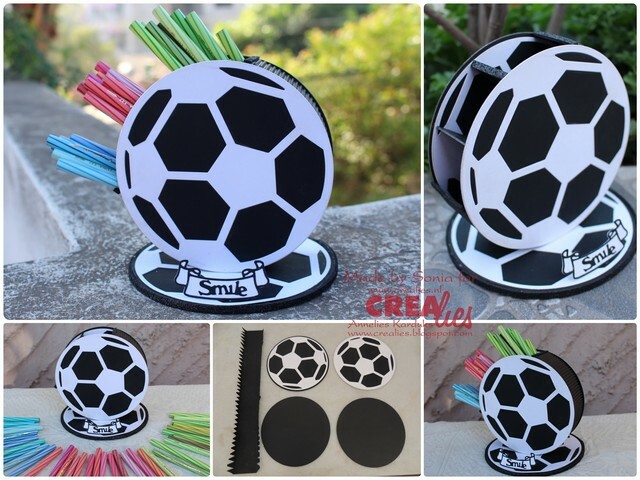 The size of the diecuts is large enough to make a ball party decoration ,Party prop,a box, a shaped card or a functional and unique handmade Penstand like the one you see here. It is pretty simple to make the Penstand. 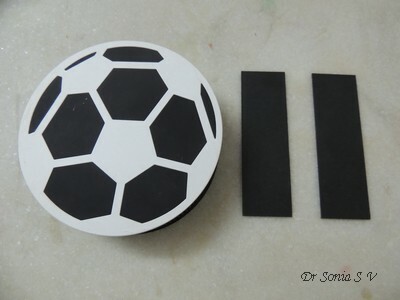 You need just a minimum of 2 Soccer ball diecuts and a strip of thick cardstock to make the wall. For aethestic and functional strength you can add 2 extra black circles to form the basic framework as shown in the picture below. 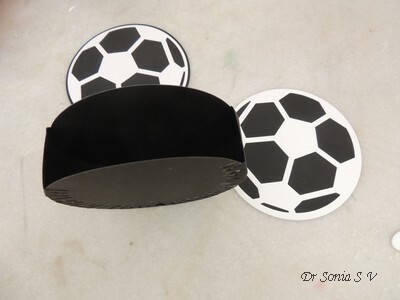 The curved wall is made using a strip of card stock with wedges cut on the sides to enable you to easily stick the strip in a curved fashion to the circular sides of your Ball Penstand. 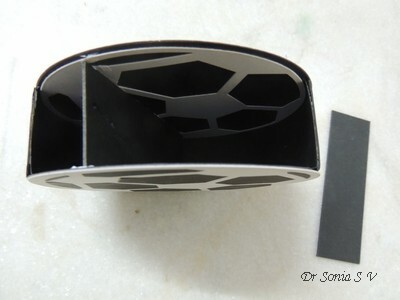 Vary the length of the strip according to how big you want the opening of the penstand to be. 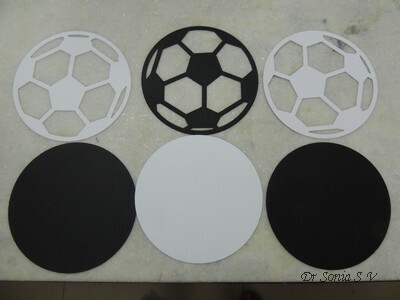 Once you stick the cardstock strip to the black base circles, add the Soccer ball design diecuts. 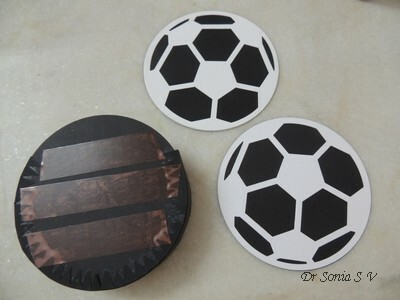 If you want to create a partitioned Penstand , add chipboard pieces as shown below inside the Ball. Vary the length of the chipboard pieces according to your wish as it will change depending on the angulation and placement inside the penstand. 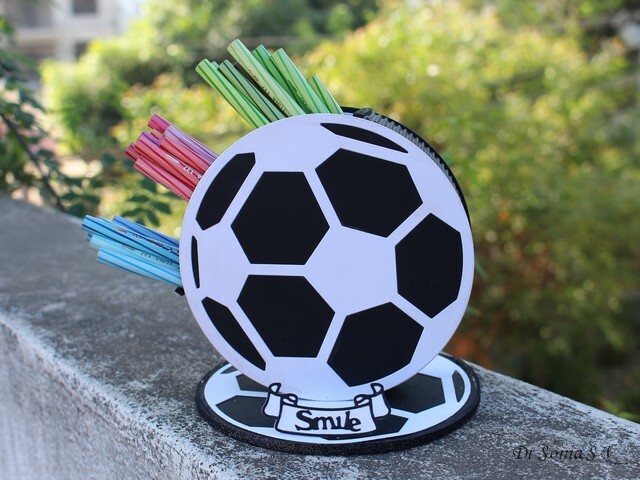 You can add a base to the Ball Penstand to help make it more sturdy. 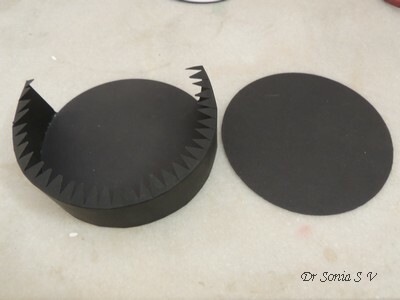 The base is made using the same dies using cardstock and 2 layers of black craft foam. It does look cute with the lovely watercolor pencils arranged neatly inside doesnt it? I have kept the decoration simple adding just a simple" Smile" on my favourite Crealies scroll banner diecut. I hope you liked this idea. My daughter loved it and has claimed it for her study table! That turned out so cool! I love the 3D pen holder!! 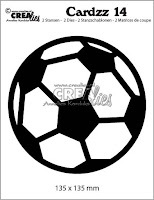 Fun idea for a soccer ball design!! 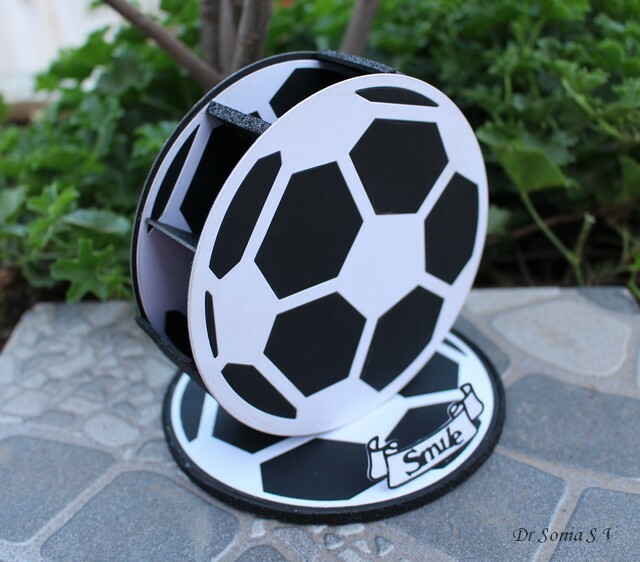 You come up with such unique designs Sonia and this one is genius, thanks for sharing how you created it. This is fabulous Sonia, a great idea. Wow wow wow!! This is AMAZING!! I loveeeeeeeeee it!!!!!!!!!!! What a fantastic idea and great gift for a male too. You have such great ideas Sonia. Beautiful & so cool :) any kid would be thrilled to own it. Thanks for sharing. So creative and beautiful! Love it. Wow, such fabulous gift for a boy!!! Thanks for sharing the tutorial!!! Wow that's such a great creation, fantastic. 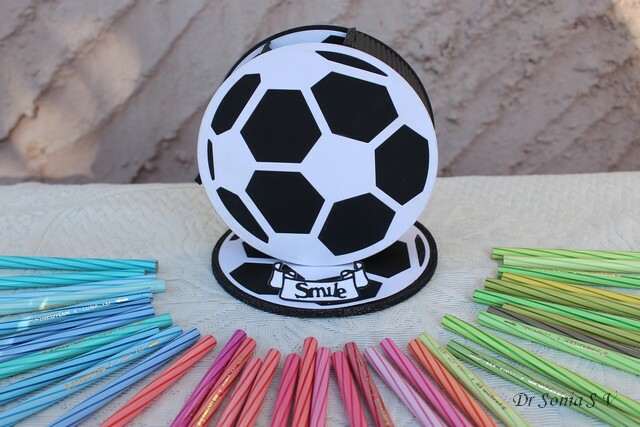 Just right for a Soccer Ball fan. Well! what a wonderful idea and so useful too. LOVE it SOnia. That is so clever and very effective Sonia..great project.